I spent a wonderful week in Hendersonville, NC at Kanuga Watermedia Workshops with artist ,Iain Stewart. We focused more on technique rather than finished paintings which was so important, especially since I haven’t been painting for a while. The first painting was done after lots of exercises with washes and atmospheric techniques. This was from a photo that Iain provided...getting the large shapes in and then let your imagination go ...so this was right up my alley! i enjoyed this class so much because Iain’s process is from sketchbook to painting, taking a lot of time on that sketch and planning the painting. Workshops are for learning, soaking up the creative atmosphere and getting inspired to work harder at home and of course meeting new friends! May 2018. Plein Air Day ! love it! Wonderful to be out on this beautiful spring morning taking in the beauty around me. Painted "Riverdale Farm" . Painted with “Tuesday Painters” on location in Riverdale in Knox Co. TN. Was happy that this painting found a home. I find painting little landscapes during these winter months help boost my spirits! I miss painting outside ..my time to be surrounded by all that God has created. These little miniature paintings are my way of giving Thanks! "I lift my eyes to the mountains- where does my help come? I like to paint original cards to give to someone special. I use watercolor paper and cut in standard size cards . I use card stock and envelopes to mount the painting on. They can use on an easel to display or frame or give as a gift. Painting snowmen always gets me in the Christmas Spirit! 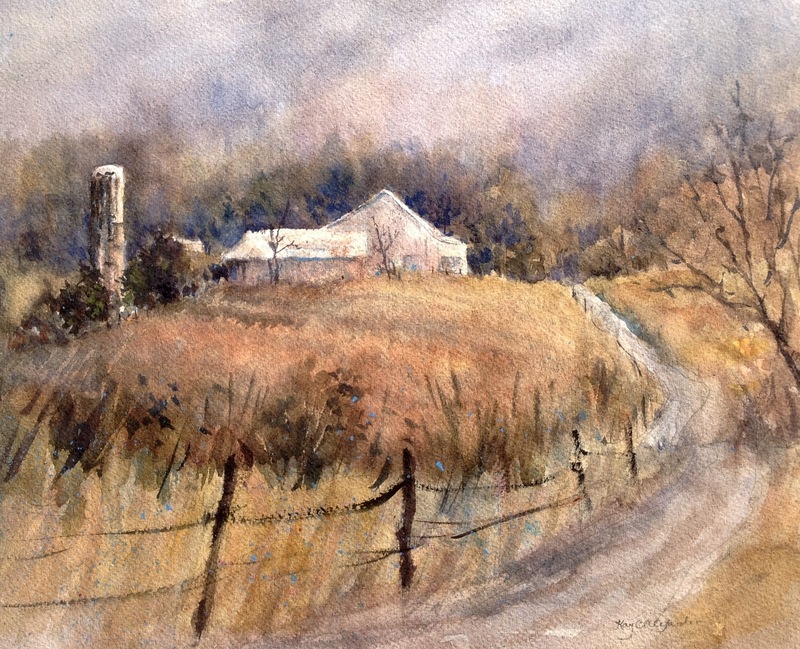 I recently went with my plein air group to a friend's farm. A lovely place with so many inspirational scenes! I decided on the bee hives among the tall grass and wild flowers. I was very pleased to sell this piece to the homeowners! "This is my Father's world: he shines in all that's fair; in the rustling grass I hear him pass; He speaks to me everywhere. ".....................from the hymn, This is My Father's World. I recently had the privilege of attending a workshop in Stonington, ME with Frederick Graff. This is my second workshop with this amazing artist and teacher! He gave us exercises and assignments to help us with compostion , color harmony, perspective and so much more. It was challenging for me but exactly what I needed. This is a study I did in lights and darks and trying to practice saving those wonderful whites! I think I do okay with Rainy Days! Rainy day mini paintings and catching up in my journal. "Life is too short not to create, not to love, and not to lend a helping hand to our brothers and sisters." I spent a week in a workshop with Keiko Tanabe, in Hendersonville, NC at Kanuga .I took her class 2 years ago and enjoyed it so much that I wanted to learn from her again. We spent plein air time and studio time and was a great week of painting and meeting new friends. Being outside and enjoying the quiet is such a gift! Painting I completed after Keiko's demo of same location. "I have learned that what I have not drawn, I have never really seen, and that when I start drawing an ordinary thing, I realize how extraordinary it is, sheer miracle".......from the book, Your Artist's Brain by Carl Purcell. It is too cold these days for sketching and painting outdoors so I am working on my travel journal. Below are three pages from our trip to Fish Creek, WI during October when the skies are so blue and the colors of the trees are amazing!
" I think that I shall never see, a poem as lovely as a tree"
I was inspired today looking out my back window on a grey, cloudy day and seeing the trees that were so full of leaves just a few days ago....now standing bare and still so beautiful! This past week, I had the thrill of painting outside with a group of amazing artists at the Appalachian Paint Out in Weaverville ,NC. The weather was perfect and the Autumn colors were at their peak. Sitting by a mountain stream and painting the view of the early morning sunlit meadow. I almost had to pinch myself that I wasn't dreaming! I did a lot of sketchbook work and that was fun too! Plein Air painting has been so much fun and has brought me a lot of joy! A time to enjoy nature and share with some great artists. Still doing watercolor sketches and maybe some will become larger paintings but right now just enjoying filling my sketchbooks. I am back in the studio and just completed this painting. . My son, for his birthday, wanted a painting of Aspens in the snow. I've never been to an area in the winter that has Aspens but I have been to Colorodo in the summer. They are beautiful trees growing straight and tall. I pictured how they would be in the snow casting long shadows. The painting is 10.5 x 28 on 300# paper.. I call it "Cory's Aspens" ..hope he likes it. Spent a week in Boone, NC attending a workshop led by Brenda Swenson," Keeping a Watercolor Sketchbook". It was at Cheap Joes Workshop and Outlet Store, an excellent facility and great staff. Brenda is not only a wonderful artist but a caring and energetic teacher. We focused on contour line drawing , light and shadows, composing our sketches and painting to bring our sketch to life! Our last day we did a sketch collage of different sketches linked together to tell a story. I chose to illustrate my week at the workshop. I enjoyed my week so much and felt a renewed excitement to keep my journals and continue my efforts in improving my painting. After returning, I put what I learned to use by going to a local farm with "Tuesday Painters", a plein air group. I used my sketchbook and pen and light washes of watercolor. Plain Air sketch with pen and watercolor. Janurary 23, 2015 Happy New Year! Started the New Year shopping for art supplies. Found something new to me..liquid graphite. It is great for sketches and especially value studies. All you do is use a little water and a brush. I love new art stuff! Additions to the travel journal of Amsterdam and Utrecht , Netherlands. Starting a travel journal doing sketches from favorite places we visited. It sure is a lot more fun than compiling a bunch of photos! art books and kept up with my journal and sketchbooks. After returning from a wonderful three week trip to Europe, I felt like getting back to it. from my imagination and letting the watercolors do what they do! I had to get their sunny faces in a painting! Hopefully, this is the beginning of some new work. 30 minutes to one hour each day. Draw freehand and check angles and proportions. so much information to fill more than five days! Another wonderful plein air and studio painter and such an amazing teacher. The sketches are from my sketchbook while working outside at a local nursery. My goal is to try to start doing a sketch and value study before I paint. I just returned from a wonderful workshop with Keiko Tanabe in Hendersonville, NC. a simple scene, sketch and do a value study first before starting to paint. are working back in the studio. Draw out the best of it. Write down something unique on the facing page. Let your art make each day memorable." I have grown to love the feel of the paper and the texture it gives to the paintings. 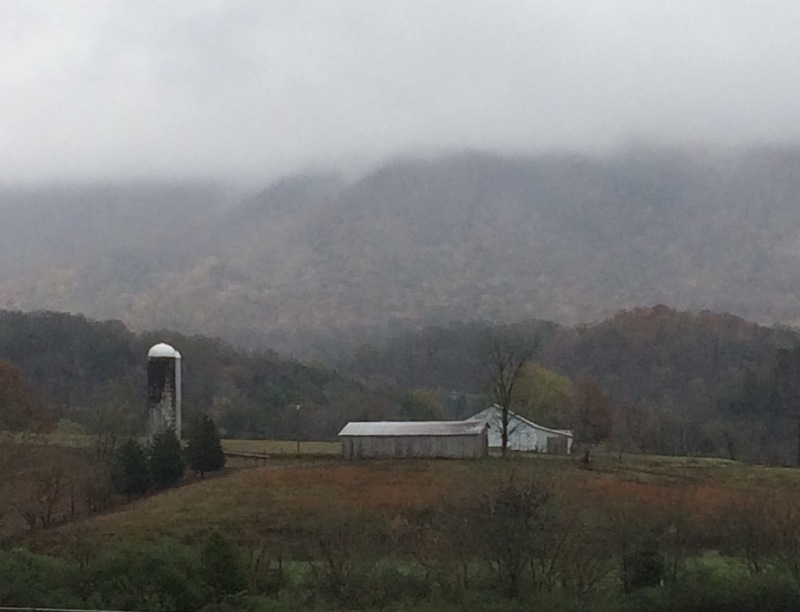 A beautiful winter day in Dandridge! I feel a new painting.